Leftovers are a great way to save time and reduce food waste! Cooked food should not remain at room temperature for more than two hours. Be sure to put leftovers in a clean, covered container. It is better to store large amounts of leftovers in a few smaller containers than one large container. When stored properly, leftovers can last between one and four days. Don’t risk wasting food by relying on your memory to know when you made that casserole. Be sure to put a label with the name of the food and the date you made it on the package. Set the refrigerator to keep the temperature at or below 40°F.Keep your refrigerator thermometer at the front of the shelf or in the door. Those are the two warmest areas of the fridge. Don’t overload the refrigerator. In order to work most efficiently, air must be able to circulate. Refrigeration doesn’t stop bacteria from growing but it does slow it down. If you don’t know when you’ll eat the leftovers, package it up and freeze it! Your freezer should be kept at 0°F. 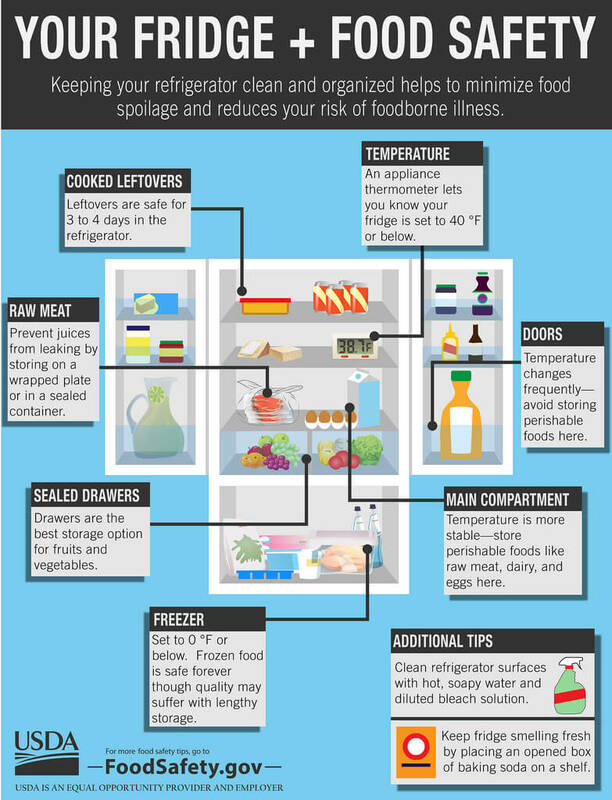 Just as you would food in your refrigerator, it is even more important to label and date food in your freezer. If you are ever in any doubt of how long something has been in your fridge, don’t chance it, throw it out.